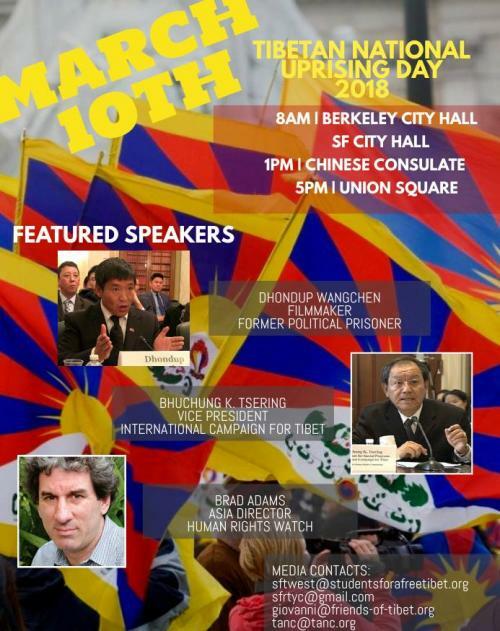 WHAT: On March 10, 2018 hundreds of Tibetans and Tibet supporters in the San Francisco Bay Area will join thousands of people around the world in the annual global commemoration of the 59th anniversary of the Tibetan National Uprising. WHY? It is 59 years since hundreds of thousands of Tibetans rose up and demanded an end to China’s illegal invasion and occupation of their country. China’s use of extreme force to quell these protests compelled His Holiness the 14th Dalai Lama to escape to India, where he has lived in exile ever since. Today, China is stepping up its efforts to punish Tibetans in Tibet for expressing loyalty to His Holiness the Dalai Lama - a devotion that has not wavered despite the half century that has passed. The human rights situation in Tibet has declined dramatically in recent years with the fundamental rights to freedom of expression, peaceful assembly, religion, and privacy highly restricted. Since the Chinese occupation in 1959, more than one million Tibetans have been killed. To fly a Tibetan flag, send an email abroad, or say the phrase "human rights," is cause for imprisonment and torture. 99% of all Tibetan monasteries have been closed. Media is greatly restricted and near 150 Tibetans burned themselves alive since 2009 to protest conditions in Tibet under Chinese government rule. This March 10, tens of thousands of Tibetans and Tibet supporters will be taking to the streets across the globe.